Well, dear readers, it was more book folly yesterday. We all thought it was not possible for them to have printed the new files that quickly and we were right. What actually arrived were another box containing my seventeen free books and they were the wrong version. This is the third time they’ve sent me these free books so I don’t know what’s what, but it seems like things are a little confused somewhere. The order that was placed on Monday afternoon should perhaps have been printed at some point yesterday or hopefully will be today and then overnighted. It’s enough to make one’s head spin, like Linda Blair in The Exorcist. Otherwise, yesterday was a reasonably okay day. I got about seven hours of sleep, got up, and went to pick up the books when they arrived at ten-thirty, ascertained what they were, and deposited them into the trash. I also picked up a couple of other packages, then came right home. I answered e-mails and got everything prepped for our new release announcement. And so here is said new release announcement. We decided to make it a two-title release because I’m not sure we’ll have anything for the next three or four weeks. And for those who want both, it will save them some postage. 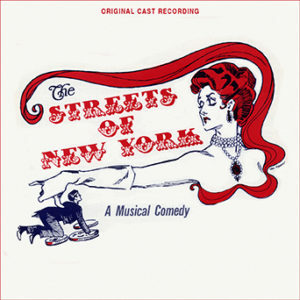 First is the off-Broadway cast album of The Streets of New York, a delightfully delightful score. There was a long out of print and quite poorly done previous CD that goes for a lot of dough, but we’ve cleaned up the sound as much as we could (the recording itself was very amateurly done back in the day), but in the end I think you’ll really enjoy the score a lot, kind of a classic early 1960s off-Broadway score with two pianos, a sound I love. And a fun thing is that one of the pianists is – Lanny Meyers. I saw this on what was then Pay TV in our new Beverlywood home on our TV set in the den. I think it cost around a dollar or something like that, and I watched it three or four times. We’ve been trying to see if that video exists anywhere, but my pal at the TV Museum says they don’t have it. Anyway, it’s a treat to issue it. Here’s the cover. The second release is a kind of reissue of something we did very early on but taking two CDs of material and reconfiguring them to make a more interesting package on one CD. 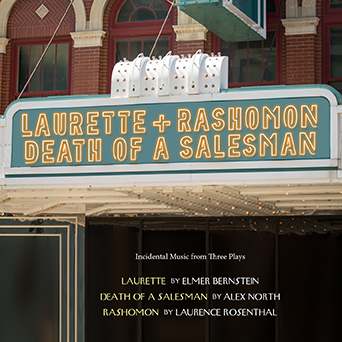 It’s the incidental music for three plays – Laurette by Elmer Bernstein, Rashomon by Laurence Rosenthal, and Death of a Salesman by Alex North, three folks who were known more for their film scores. The music is really good (originally Laurette was coupled with a Bernstein film score that didn’t fit at all stylistically, so we coupled the theater score with the other two and voila), especially Laurette, which kind of prefigures the kind of score Bernstein would write for To Kill a Mockingbird. The original releases were as good as we could make them back then considering the sources available, but they’re being completely redone now by Chris Malone who is great with that kind of older and somewhat problematic material. The sound samples are not the remaster, however, as we’re still tweaking. Here’s the cover. I’ve had lots of requests for these – they were pretty quick sellouts back in the day. Doug couldn’t get the pages ready due to his oh so busy schedule of being an ACTOR at the Group Rep – so this won’t actually go live until noon – I should be back from the car place by then. However, if you dear readers want a jump on it, you know how that works. Just be sure to put the CD titles in the invoice. I made myself some faux chicken stroganoff over rice and that was great, really great actually. Frankly, I could eat that every day. I left two tiny chicken filets for later as a snack, but it wasn’t all that much, ounces-wise, anyway. After that, I had some telephonic calls and then I sat on my couch like so much fish. Last night, I watched a motion picture on Blu and Ray entitled For a Few Dollars More, the middle film in what is called the Dollars trilogy. I’ve always enjoyed this film a lot, and this new transfer from Kino is really aces. They botched the other two films, so it’s great that they got this one right. The color is great, and it looks just like Techniscope should look. And the interplay between Clint and Lee Van Cleef is just great. Then I watched another motion picture on Blu-ray, this one entitled Detour, a film of Edgar G. Ulmer, starring Tom Neal and Ann Savage. A really low-budget movie – I mean REALLY low-budget. It’s weird and wacky and Miss Ann Savage gives a performance worthy of her last name. Mr. Neal is quite a weird screen presence and his character is really surprisingly weak for a male of that period. The film is so nihilistic that it gives nihilistic a run for its money. There are a couple of rear projection shots driving down Hollywood Blvd. that are really fun. But mostly, it’s cheap sets. Now, this film has always looked hideous on home video due to its public domain status. But painstaking work has been done here from some good elements and the result is a real shocker. While it can’t escape it’s low budget look, it looks the best I’ve ever seen it – miles and miles better than any other viewing, whether on film or video, at least in my experience. 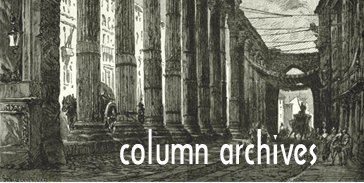 It’s 77-minutes long and a must-have for anyone who loves noir, nihilism, and nuttiness. Highly recommended by the likes of me. After that, I relaxed and listened to music, and determined to get to be at a reasonable hour because I have to be up by seven-thirty in the morning to take the motor car in. Today, I’ll be up early to take the motor car in for a lube and oil and a smog check and I should think it wouldn’t take longer than ninety minutes. I’ll walk down to Jerry’s Deli, have a light breakfast, then walk back. As soon as I’m home we’ll be able to make the new releases live at Kritzerland. Then I can relax and hopefully print out a LOT of orders. I’ll pick up some packages at some point, and hope for good news in terms of the book order being shipped. Tomorrow, I have a work session for the Kritzerland show, Friday I’m attending an opening night, Saturday I do a musical theater workshop at the Group Rep for three hours and I’m sure some of us will go eat afterwards. Sunday, I’m doing a phone interview about The Creature Wasn’t Nice aka Spaceship aka Naked Space. 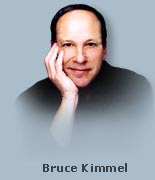 Then we begin our Kritzerland rehearsal week. Well, dear readers, I must take the day, I must do the things I do, I must, for example, be up early, take the motor car in, have a light breakfast, pick up the motor car, make our new releases live at Kritzerland, hopefully pick up packages, hopefully print out a LOT of orders, and then relax. Today’s topic of discussion: It’s Ask BK Day, the day in which you get to ask me or any dear reader any old question you like and we get to give any old answer we like. So, let’s have loads of lovely questions and loads of lovely answers and loads of lovely postings, shall we, whilst I hit the road to dreamland, happy to announce two really nice releases.